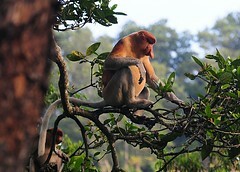 The proboscis monkey or long-nosed monkey, known as the Bekantan in Malay, is a reddish-brown arboreal Old World monkey that is endemic to the south-east Asian island of Borneo. It belongs in the monotypic ironically named genus Nasalis. The monkey also goes by the Malay name monyet belanda meaning Dutch monkey, or even orang belanda literally meaning Dutchman, as Indonesians remarked that the Dutch colonisers often had a similarly large overfed looking pot-belly and big red drinking nose. Tea, coffee, wine, beer and rubber can all be made from dandelions. 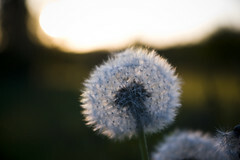 In the Midlands of Britain around the area where Shakespeare came from, a goldenlad is dialect for a dandelion in full yellow flower and a chimney-sweeper is the name for a dandelion ‘clock’. Flamenco dancer Jose Greco (1918-2000) took out an insurance policy through Lloyd’s of London against his trousers splitting during a performance. A dancer with the Royal Ballet gets through about 120 pairs of shoes a season. Dandelions are also known as Pissy beds, Jack-piss-the-bed, Wet-the-bed, Wet-a-bed, Tiddlebeds and Pissenlit. Fear of the number thousand. From the Ancient Greek: khilioi, meaning the cardinal number 1000.